Feiring’s definition is useful precisely because it discriminates: it includes some wines and excludes others. It is, moreover, relatively clear about what falls on either side of the line. Nothing added: no acid adjustments if the grapes come in too ripe, no sugar if they’re not ripe enough, no commercial yeast or “yeast food,” certainly no MegaPurple to punch up color and sweetness. Nothing taken away: no reverse osmosis to strip volatile acidity or other faults or to reduce alcohol, and not filtered. It leaves some grey areas: can Amarone, Tokaji, or any other wine traditionally made with semi-dried grapes be “natural,” since water is removed from the grapes? What about saignée? But trouble really ensues when we get to that last bit about the touch of sulfur and the rationale behind it. To be clear, Feiring and most natural wine-ists would rather wine not include sulfur and at the very least expect to see minimal amounts of it. Still, the obvious question is why adding any sulfur is okay when adding anything else isn’t. Feiring says that this is “the way wine used to be made for centuries and centuries.” There’s something to be said for historical arguments: generally speaking, many opinions gathered over time are better than one opinion from right now. And yet, long is the list of ancient practices found wildly incorrect or dangerous by modern science, including plenty having to do with wine. 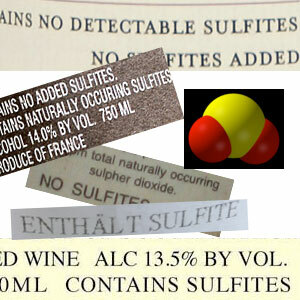 Sulfur, by which Feiring means sulfur dioxide or SO2, has been used as a wine preservative for at least 600 or so years and probably much, much longer. We know that the ancient Greeks and Romans burned sulfur candles as a general fumigant and it’s generally assumed that they used the stuff with wine, though the historical record hasn’t left us with any specific accounts. 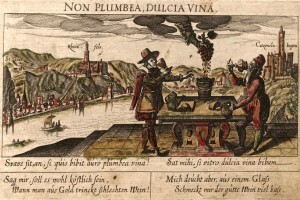 The first solid mention of SO2 in winemaking dates from a 1487 German text, still more than long enough ago to count for “centuries and centuries” even if purified and powdered potassium metabisulfite (the easiest way to dose wine) wasn’t available to winemakers until the twentieth century. So SO2 has historicity in its favor, but sulfur is far from the only ancient or traditional wine helper. Roman recipes for “wine” include everything from honey to seawater to lavender to lead. And here we return to the idea of ancient but wildly incorrect practices. Lead has nearly as noble a history in winemaking as sulfur does. It was added to increase sweetness right into the 18th century – yes, lead tastes sweet, though please take my word for it. It wasn’t only a tool of fraudulent salesmen trying to pass spoiled, vinegary wine as drinkable, either (though plenty of that happened); if period cookbooks are any indication, even housewives honestly looking to prepare a palatable drink turned to lead. The practice was banned in Württemburg (one of the more southerly states in what was then the Holy Roman Empire) in 1696, but remained common across Europe for at least fifty years or more thereafter. Well after chemists and physicians knew of the health dangers of lead, unfortunately. 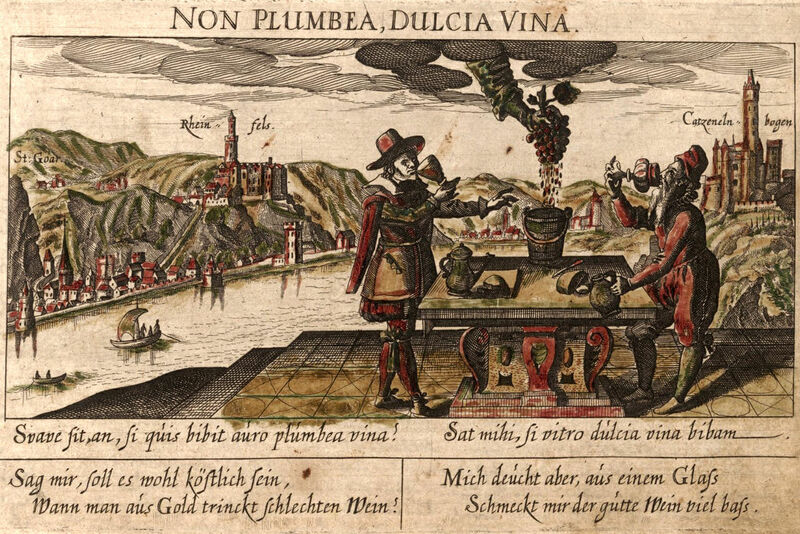 Historical use alone isn’t a convincing reason to give natural wines a pass on added SO2. A better argument is that sulfur dioxide is, hands down, the most useful of all wine additions. Better still, it occurs naturally in every wine: all yeast make some naturally during fermentation, though rarely in quantities large enough to be of any real use. Added in larger doses it answers all sorts of winemaking wishes –protection against yeast and bacterial growth, protection against browning, preservation of aromatics by blocking the oxidation that destroys them– and it’s inexpensive and easy to use, too. Wine made without added SO2 almost always has a shorter shelf life (sometimes very short indeed) both because oxidation is likely to destroy fresh, fruity flavors and because it’s prone to microbial spoilage if the winemaking process wasn’t perfectly, perfectly clean. And, in the quantities used in wine, it’s harmless to everyone save a minor fraction of asthmatics. If you’re in that group you’ll know – you’ll have severe asthma and also be unable to eat sulfured dried fruit and a depressingly long list of other things – and if you’re not, don’t blame the sulfites if red wine gives you a headache. SO2 is considered almost (almost) essential for good winemaking, but saying that natural winemakers can use SO2 because it’s useful and harmless sends us down a slippery slope, head first, on roller skates. If a natural winemaker can add sulfur because it makes better wine and because tiny bits of it are already naturally present, then why can’t she also add larger amounts of other naturally occurring wine molecules? Acid and sugar are useful and harmless (as they’re used in wine), and already found naturally in grapes. Winemakers who use them certainly argue that these tools let them make better wine, and not just cosmetically. Adding acid is as often motivated by microbial stability – most wine spoilage culprits are much less happy at pH 3.2 than pH 4.0, for example – as flavor balance, and SO2 is more effective in more acidic wines. So wine chemistry hands us an interesting problem. The most common wine additives are just bolstering up or balancing out some constituent the wine already has. Grapes came in a bit riper than expected, with a lot of sugar and not much acid? 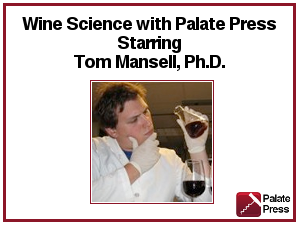 Add tartaric acid to lower the pH, to make the wine taste more balanced and stave off microbial spoilage. Tartaric acid comes from grapes and the winemaker is simply recreating what would have happened had the weather been a bit different or the picking crew available a day or two earlier. Ordinary chemical analysis (without getting into tracking radioisotopes) won’t reveal a difference between the added acid and the grapes’ own. So, why isn’t the resulting wine still natural? Because we’ve fussed with what the grapes handed us; we’ve added something. To me, the best way out of the circularity of this puzzle is to argue that SO2 isn’t really adding anything to wine; it protects and preserves what the wine already has rather than adding something new. It’s the difference between covering my face in sunscreen versus foundation: the sunscreen should do something to prevent me from developing sun spots and wrinkles in the future; the foundation covers up and evens out the splotches I already have. You can even argue that sunscreen is a medical product rather than a cosmetic, but foundation is just makeup. The analogy is apt. Some people would argue that makeup is always unnecessary and even ugly or harmful, that it obscures natural beauty, that it appeals to some socially normalized idea of what beauty should be rather than recognizing that true beauty comes from the authenticity of personality and lived experience. It’s hard to make that argument work for sunscreen. I’m not covering anything up. I’m protecting my short-term health – I don’t want a sunburn – and my long-term health – I don’t want skin cancer. SO2 is sunscreen for wine, protecting it against browning, lost aromatics, oxidized notes, and spoilage microorganisms. Nothing else falls quite so squarely into that protect-not-add box; every other wine preservative (and there aren’t really many, because SO2 does the job so satisfactorily, acid included) adds something in the way of flavor or fails to be as securely harmless. That leaves us with the very fair argument that exceptionally careful winemaking, maybe the equivalent of wearing a broad-brimmed hat and staying out of the mid-day sun, can do without sulfur altogether. Maybe 200 years from now we’ll have developed reliable techniques for no-sulfur-added winemaking, just as we can confidently avoid lead today. In the meantime, I can forgive anyone for wearing a bit of sunscreen. Very good, well informed post. This is a tricky line to tread when the romantics in wine want to opine on the technical tools used by those whose job it is to actually make a commercially viable product. In my opinion the thing that makes this line the most diffucult is the fact that Ms. Feiring is generally right about non-interventionist winemaking – but she is right for all the wrong reasons. I’m not sure about the sunscreen analogy. SO2 changes the sensory and chemical characteristics of a wine (most would say positively), it binds to aldehydes, phenolics, and alters the whole redox balance within the wine – i.e. the whole point of its use. It is not just a protective coating. So to me, the sunscreen argument doesn’t hold to allow the natural winemakers a legitimate way to include SO2, and not explain why it should be treated differently from any other “natural” additive. To me its pretty simple; if you buy wine direct from the tank or barrel and it is intended to be consumed locally and fresh then natural winemaking without sulphur should be the aim. However, if you want to take that same wine on a distance or time based journey – then its probably going to need some SO2, and most wine is consumed in the latterly fashion. Ironically, top quality, contemporary dry wines have very low SO2 levels when compared with even a generation ago, due to improved bottling technology among other things. And dare I say it, bottle closures that are inert and totally exclude oxygen ingress allow us to lower the SO2 bar even further – an aim for all good winemakers whether they claim the natural badge or not. Rod, fair point about my analogy. If I was going to really try to stretch it, I’d say that wearing sunscreen changes your skin, too (greasier/oilier, extra chemicals on your face probably have extraneous effects), but I’d rather just say that analogies are always imperfect.